Protesters walking towards the Gaza separation fence, bordering Israel.The UN Independent Commission of Inquiry on the protests in the Occupied Palestinian Territory presented its findings in Geneva on 28 February, 2019. Speaking in Geneva, Santiago Canton, Chairperson of the Commission of Inquiry on the 2018 protests in the Occupied Palestinian Territory, explained what the panel knew about the Israeli Defence Force’s relevant military protocols with regard to demonstrators. Mr. Santiago’s comments followed his assertion that the panel’s “main conclusion…is that we found reasonable grounds to believe that the Israeli Security Forces committed serious violations of human rights and international humanitarian law”. During last year’s demonstrations in the Gaza Strip - referred to as the “Great March of Return and the Breaking of the Siege” - the Commission found that 189 Palestinians were killed, 183 with live ammunition. Victims included children, persons with disabilities – including a double amputee who was shot and killed while sitting in his wheelchair - journalists and medical personnel. In addition to those killed during weekly protests at the border fence with Israel, the UN panel underscored the damage caused by high-velocity bullets, which replaced the rubber bullets initially used against demonstrators. “In the case of many of the killings, there were very small entry wounds and huge exit wounds,” Commission member Sara Hossain said. “We also have detailed evidence about the kinds of bullets, but also about the use of long-range sniper rifles, sophisticated optical aiming devices,” she added. Asked about the legality of targeting unarmed protesters in a crowd, the Commission insisted that doing so based on individuals’ membership of an armed group was unlawful. “We believe that in situations of crowd control and in situations that we deem to be civilian in nature, if there are individuals in the crowd that may be a legitimate target, you still cannot shoot at the crowd, because you may kill or shoot innocent individuals”, Mr. Santiago said. The Commission also welcomed inquiries into 11 incidents which Israel has said it will undertake, although Ms. Hossain called for more transparency. The issue of demonstrators launching incendiary kites and balloons from Gaza was also covered in the Commission’s report to the Human Rights Council, Ms. Hossain said, noting that “significant property damage” had been caused in southern Israel. 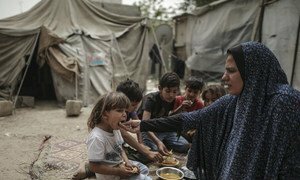 In a related development on Monday, Human Rights Council-appointed Special Rapporteur Michael Lynk warned of an impending “humanitarian catastrophe” in Gaza linked to the “stifling restrictions” on the Strip’s residents. A major concern is the “collapse of natural sources of drinking water in Gaza and the inability of Palestinians to access most of their water sources in the West Bank”, the Special Rapporteur said. Coinciding with developments at the Human Rights Council on Monday, the World Health Organization (WHO) appealed for $5.3 million to help the many thousands of Gazans hurt and handicapped in the demonstrations. 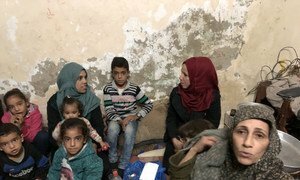 “The sheer magnitude of trauma needs in Gaza is immense; every week injured patients continue to arrive at hospitals requiring complex long-term treatment.” said Dr Gerald Rockenschaub, head of WHO’s office for the Occupied Palestinian Territory. WHO reiterated concerns that the upcoming one-year anniversary of the Great March on 30 March could result in further casualties and an increase in people requiring trauma care and rehabilitation services. Since the beginning of the year, Israeli security forces have responded to protests along Gaza’s border fence with tear gas, rubber coated bullets and live ammunition that have caused death, injury and fear, which the UN’s independent human rights expert on the region described on Tuesday as “a recipe for more bloodshed”.